This sign is a lightweight, durable, weatherproof indoor or outdoor sign. 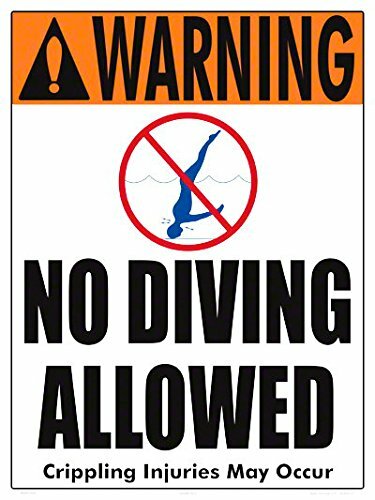 All of our swimming pool and facility signs are of the highest quality and predrilled for easy hanging. Each sign is printed using our high-quality weather and sun resistant inks. Sign Design and Construction: Signs are digitally printed with UV resistant inks to prevent fading. All four corners of our plastic signs are pre-drilled with 1/4 inch grommets pre-installed for easy mounting. Recommended for mounting on walls or other flat surface mounting. Plastic signs are not recommended for high wind environments. Either aluminum or dibond signs should be substituted for greater sign life. Image is printed directly onto sign substrate. No low quality vinyl lettering is used on any of Aquatic Technology's signs. This sign is a lightweight, durable, weatherproof outdoor sign. Choose either Plastic or Aluminum! Signs are digitally printed with UV resistant inks to prevent fading. All four corners of our plastic signs are pre-drilled with 1/4 inch grommets pre-installed for easy mounting. Recommended for mounting on walls or other flat surface mounting. If you have any questions about this product by Aquatic Technology, Inc., contact us by completing and submitting the form below. If you are looking for a specif part number, please include it with your message.